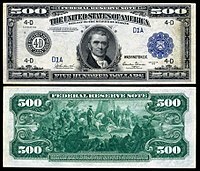 Federal Reserve Notes are legal tender, with the words "this note is legal tender for all debts, public and private" printed on each note. 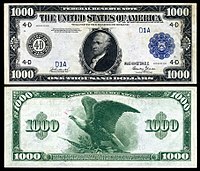 They have replaced United States Notes, which were once issued by the Treasury Department. 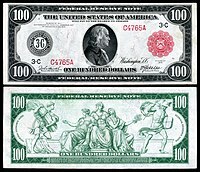 Federal Reserve Notes are backed by the assets of the Federal Reserve Banks, which serve as collateral under Section 16. These assets are generally Treasury securities which have been purchased by the Federal Reserve through its Federal Open Market Committee in a process called debt monetizing. This monetized debt can increase the money supply, either with the issuance of new Federal Reserve Notes or with the creation of debt money (deposits). This increase in the monetary base leads to a larger increase in the money supply through fractional-reserve banking as deposits are lent and re-deposited where they form the basis of further loans. Prior to centralized banking, each commercial bank issued its own notes. The first institution with responsibilities of a central bank in the U.S. was the First Bank of the United States, chartered in 1791 by Alexander Hamilton. Its charter was not renewed in 1811. In 1816, the Second Bank of the United States was chartered; its charter was not renewed in 1836, after President Andrew Jackson campaigned heavily for its disestablishment. From 1837 to 1862, in the Free Banking Era there was no formal central bank, and banks issued their own notes again. From 1862 to 1913, a system of national banks was instituted by the 1863 National Banking Act. 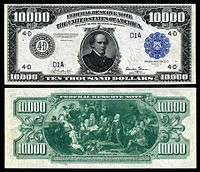 The first printed notes were Series 1914. In 1928, cost-cutting measures were taken to reduce the note to the size it is today. At the time of the Federal Reserve's creation, the law provided for notes to be redeemed to the Treasury in gold or "lawful money." 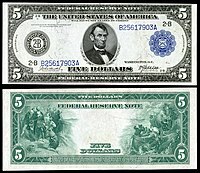 The latter category was not explicitly defined, but included United States Notes, National Bank Notes, and certain other notes held by banks to meet reserve requirements, such as clearing certificates. The Emergency Banking Act of 1933 removed the gold obligation and authorized the Treasury to satisfy these redemption demands with current notes of equal face value (effectively making change). Under the Bretton Woods system, although citizens could not legally possess gold (except as rare coins, jewelry, for industrial purposes and the like), the federal government continued to maintain a stable international gold price. This system ended with the Nixon Shock of 1971. Present-day Federal Reserve Notes are not backed by convertibility to any specific commodity, but only by the collateral assets that Federal Reserve Banks post in order to obtain them. 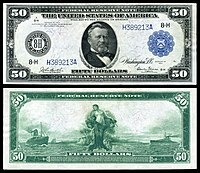 Large size notes represent the earlier types or series of U.S. banknotes. Their "average" dimension is ​7 3⁄8 × ​3 1⁄8 inches (187 × 79 mm). 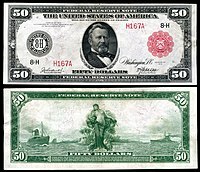 Small size notes (described as such due to their size relative to the earlier large size notes) are an "average" ​6 1⁄8 × ​2 5⁄8 inches (156 × 67 mm), the size of modern U.S. currency. 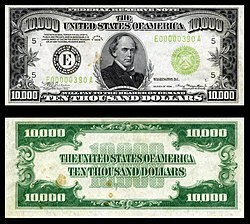 "Each measurement is ± 0.08 inches (2 mm) to account for margins and cutting"
A Federal Reserve Bank can retire notes that return from circulation, which entitles it to recover collateral that it posted for an earlier issue. Retired notes in good condition are held in the bank's vault for future issues. Notes in poor condition are destroyed and replacements are ordered from the BEP. The Federal Reserve shreds 7,000 tons of worn out currency each year. 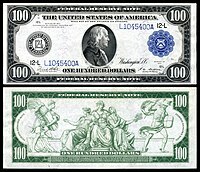 Starting with the Series 1996 $100 note, bills $5 and above have a special letter in addition to the prefix letters which range from A-L. The first letter is A for series 1996; the first letter is B for series 1999; the first letter is C for series 2001; the first letter is D for series 2003; the first letter is F for series 2003A; the first letter is H for series 2006; and the first letter is K for series 2006A. The Series 2004 $20, the first note in the second redesign, has kept the element of the special double prefix. The first letter is E for series 2004; the first letter is G for series 2004A; the first letter is I for series 2006; the first letter is J for series 2009; the first letter is L for series 2009A; and the first letter is M for series 2013. Despite the relatively late addition of color and other anti-counterfeiting features to U.S. currency, critics hold that it is still a straightforward matter to counterfeit these bills. They point out that the ability to reproduce color images is well within the capabilities of modern color printers, most of which are affordable to many consumers. These critics suggest that the Federal Reserve should incorporate holographic features, as are used in most other major currencies, such as the pound sterling, Canadian dollar and euro banknotes, which are more difficult and expensive to forge. Another robust technology, the polymer banknote, has been developed for the Australian dollar and adopted for the New Zealand dollar, Romanian leu, Papua New Guinea kina, Canadian dollar, and other circulating, as well as commemorative, banknotes of a number of other countries. Polymer banknotes are a deterrent to the counterfeiter, as they are much more difficult and time consuming to reproduce. They are said to be more secure, cleaner and more durable than paper notes. One major issue with implementing these or any new counterfeiting countermeasures, however, is that (other than under Executive Order 6102) the United States has never demonetized or required a mandatory exchange of any existing currency. Consequently, would-be counterfeiters can easily circumvent any new security features simply by counterfeiting older designs. U.S. currency does, however, bear several anti-counterfeiting features. Two of the most critical anti-counterfeiting features of U.S. currency are the paper and the ink. The composition of the paper is 75 percent cotton and 25 percent linen. The ink and paper combine to create a distinct texture, particularly as the currency is circulated. The paper and the ink alone have no effect on the value of the dollar until post print. These characteristics can be hard to duplicate without the proper equipment and materials. Furthermore, recent redesigns of the $5, $10, $20, and $50 notes have added EURion constellation patterns which can be used by scanning software to recognize banknotes and refuse to scan them. According to the central banks, the number of counterfeited bank notes seized annually is about 10 in one million of real bank notes for the Swiss franc, of 50 in one million for the Euro, of 100 in one million for United States dollar and of 300 in one million for pound sterling. Multiple currency sizes were considered for U.S. currency, but makers of vending and change machines successfully argued that implementing such a wide range of sizes would greatly increase the cost and complexity of such machines. Similar arguments were unsuccessfully made in Europe prior to the introduction of multiple note sizes. Alongside the contrasting colors and increasing sizes, many other countries' currencies contain tactile features missing from U.S. banknotes to assist the blind. For example, Canadian banknotes have a series of raised dots (not Braille) in the upper right corner to indicate denomination. Mexican peso banknotes also have raised patterns of dashed lines. The Indian rupee has raised patterns of different shapes printed for various denominations on the left of the watermark window (20: vertical rectangle; 50: square; 100: triangle; 500: circle; 1,000: diamond). Ruling on a lawsuit filed in 2002 (American Council of the Blind v. Paulson), on November 28, 2006, U.S. District Judge James Robertson ruled that the American bills gave an undue burden to the blind and denied them "meaningful access" to the U.S. currency system. 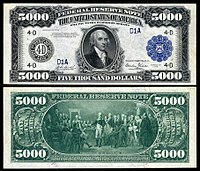 In his ruling, Robertson noted that the United States was the only nation out of 180 issuing paper currency that printed bills that were identical in size and color in all their denominations and that the successful use of such features as varying sizes, raised lettering and tiny perforations used by other nations is evidence that the ordered changes are feasible. The plaintiff's attorney was quoted as saying "It's just frankly unfair that blind people should have to rely on the good faith of people they have never met in knowing whether they've been given the correct change." Government attorneys estimated that the cost of such a change ranges from $75 million in equipment upgrades and $9 million annual expenses for punching holes in bills to $178 million in one-time charges and $50 million annual expenses for printing bills of varying sizes. Robertson accepted the plaintiff's argument that current practice violates Section 504 of the Rehabilitation Act. The judge ordered the Treasury Department to begin working on a redesign within 30 days, but the Treasury appealed the decision. On October 3, 2008, on remand from the D.C. Circuit, D.C. District Court Judge Robertson granted the injunction. As a result of the court's injunction, the Bureau of Engraving and Printing is planning to implement a raised tactile feature in the next redesign of each note, except the $1 bill (which is not allowed to be redesigned, Pub.L. 114–113, 129 Stat. 2431, enacted December 18, 2015), though the version of the $100 bill already is in progress. It also plans larger, higher-contrast numerals, more color differences, and distribution of currency readers to assist the visually impaired during the transition period. The Bureau received a comprehensive study on accessibility options in July 2009, and solicited public comments from May to August 2010. There are a few regulations to which the U.S. Treasury must adhere when redesigning banknotes. The national motto "In God We Trust" must appear on all U.S. currency and coins. Though the motto had periodically appeared on coins since 1865, it did not appear on currency (other than interest-bearing notes in 1861) until a law passed in 1956 required it. 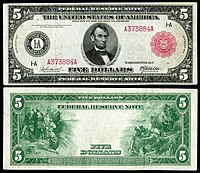 It began to appear on Federal Reserve Notes delivered from 1964 to 1966, depending on denomination. The back of the $5 bill will be changed to showcase historical events at the pictured Lincoln Memorial by adding portraits of Marian Anderson (due to her famous performance there after being barred from Constitution Hall because of her race), Martin Luther King Jr. (due to his famous I Have A Dream speech), and Eleanor Roosevelt (who arranged Anderson's performance). The back of the $10 bill will be changed to show a 1913 march for women's suffrage in the United States, plus portraits of Sojourner Truth, Lucretia Mott, Susan B. Anthony, Alice Paul, and Elizabeth Cady Stanton. On the $20 bill, Andrew Jackson will move to the back (reduced in size, alongside the White House) and Harriet Tubman will appear on the front. After an unsuccessful attempt in the proposed Legal Tender Modernization Act of 2001, the Omnibus Appropriations Act of 2009 required that none of the funds set aside for either the Treasury or the Bureau of Engraving and Printing may be used to redesign the $1 bill. This is because any change would affect vending machines and the risk of counterfeiting is low for this small bill. This superseded the Federal Reserve Act (Section 16, Paragraph 8) which gives the Treasury permission to redesign any banknote to prevent counterfeiting. $5, $10, $20, $50, $100 "This note is receivable by all national and member banks and Federal Reserve Banks and for all taxes, customs and other public dues. It is redeemable in gold on demand at the Treasury Department of the United States in the city of Washington, District of Columbia or in gold or lawful money at any Federal Reserve Bank." $1, $5, $10, $20, $50, $100 "This note is legal tender for all debts, public and private"
Note: The series 2006A was produced from 2011 to 2013 due to issues with the printing process for the colorized (NextGen) $100 notes. Note: While the series 2009A was the first series of these $100 bills released for circulation, the first printing was series 2009 printed in 2010 and 2011. These were withheld from circulation due to issues with the printing process and none were released until 2016. ^ O'Sullivan, Arthur; Sheffrin, Steven M. (2003). Economics: Principles in Action. Upper Saddle River, N.J.: Pearson Prentice Hall. p. 255. ISBN 0-13-063085-3. ^ a b "Section 411 of Title 12 of the United States Code". Retrieved March 11, 2010. ^ See generally 31 U.S.C. § 5103. ^ "The Fed - Section 16. Note Issues". federalreserve.gov. ^ Cross, Ira B. (June 1938). "A Note on Lawful Money". The Journal of Political Economy. 46 (3): 409–413. doi:10.1086/255236. ^ Friedberg & Friedberg, 2013, p. 148. ^ Friedberg & Friedberg, 2013, pp. 157–59. ^ a b Federal Reserve Bank of New York (April 2007). "How Currency Gets into Circulation". Retrieved February 17, 2008. ^ United States Department of the Treasury. "Organization chart of the Department of the Treasury" (PDF). Archived from the original (PDF) on February 16, 2008. Retrieved February 17, 2008. ^ "US Coin Facts". Fleur-de-coin.com. Retrieved February 16, 2018. ^ Federal Reserve System (October 8, 2013). "How long is the life span of U.S. paper money?". Retrieved November 15, 2013. ^ a b USPaperMoney.info. "History of Currency Designs - A last few changes, and then stability". Retrieved February 19, 2008. ^ a b "USPaperMoney.Info: Details of Serial Numbering". uspapermoney.info. Retrieved February 16, 2015. ^ a b "U.S. Bureau of Engraving and Printing - How Money is Made - Paper and Ink". www.bep.gov. Retrieved February 3, 2017. ^ "Where's George? ® 2.4 - Track Your Dollar Bills". Wheresgeorge.com. September 22, 2011. Retrieved May 5, 2013. ^ "FED". Retrieved August 21, 2006. ^ "Counterfeit". NewYorker.com. Retrieved June 6, 2018. ^ Note Printing Australia (March 2008). "Polymer substrate - the foundation for a secure banknote=2008-03-15". ^ "Security Features". The United States Treasury Bureau of Engraving and Printing. Archived from the original on October 27, 2014. Retrieved October 27, 2017. ^ Michel Beuret, "Les mystères de la fausse monnaie" Archived October 13, 2013, at the Wayback Machine Allez savoir !, no. 50, May 2011 (in French). ^ a b "Judge rules paper money unfair to blind". CNNMoney.com. November 29, 2006. Retrieved February 17, 2008. ^ American Council of Blind v. Paulson , 463 F. Supp. 2d 51 (D. D.C. 2008). ^ "Government appeals currency redesign". USA Today. Associated Press. December 13, 2006. Retrieved March 26, 2010. ^ a b "Judge: Make Money Recognizable to Blind". The Washington Post. November 29, 2006. ISSN 0190-8286. Retrieved February 3, 2017. ^ "AMERICAN COUNCIL OF THE BLIND, et al. v. Henry M. Paulson, Jr., Secretary of the Treasury, Civil Action No. 02-0864 (JR)" (PDF). United States District Court for the District of Columbia. 2002. Archived from the original (PDF) on February 16, 2007. Retrieved February 16, 2018. ^ Bridges, Eric, ed. (October 6, 2008). "Court Says Next Gen Currency Must Be Accessible to the Blind" (Press release). American Council of the Blind. Archived from the original on October 22, 2008. ^ "Court Says the Blind Will Have Meaningful Access to Currency, Tells Government 'No Unnecessary Delays'". American Council of the Blind. ^ "Federal Court Tells U.S. Treasury Department That It Must Design and Issue Accessible Paper Currency". American Council of the Blind. ^ American Council of the Blind v. Paulson , 525 F. 3d 1256 (D.C. Cir.2008). ^ American Council of the Blind v. Paulson , 581 F. Supp. 2d 1 (D. D.C. 2008). ^ "Congressional Research Service Report RS21907" (PDF). WikiLeaks Document Release. August 11, 2004. p. 3 footnote. Retrieved February 16, 2018 – via MIT. ^ "Administrative Provisions : Department of the Treasury". Retrieved June 28, 2017. ^ "Final Report: Study to Address Options for Enabling the Blind and Visually Impaired Community to Denominate U.S. Currency, July 2009" (PDF). ^ "Regulations.gov TREAS-DO-2010-0003, Meaningful Access to United States Currency for Blind and Visually Impaired Persons". ^ "History of 'In God We Trust'". treasury.gov. Retrieved April 29, 2016. ^ "U.S. Bureau of Engraving and Printing - FAQ Library". Moneyfactory.gov. Retrieved May 5, 2013. ^ Calmes, Jackie (April 20, 2016). "Harriet Tubman Ousts Andrew Jackson in Change for a $20" – via NYTimes.com. ^ "Anti-slavery activist Harriet Tubman to replace Jackson on $20 bill". usatoday.com. Retrieved April 21, 2016. ^ Mimms, Sarah. "Why the $1 bill hasn't changed since 1929". Quartz (publication). Atlantic Media. Retrieved January 28, 2014. ^ "FRB: Federal Reserve Act: Section 16". Federalreserve.gov. Retrieved May 5, 2013. ^ Devoted to Truth. "Evolution from Gold to Fiat Money". Retrieved February 19, 2008. ^ "Series 2017 $1". USPaperMoney.info. Retrieved February 16, 2018. ^ "USPaperMoney.Info: Series 2017 $10". www.uspapermoney.info. Retrieved August 5, 2018. ^ "USPaperMoney.Info: Series 2017 $20". www.uspapermoney.info. Retrieved August 5, 2018. Friedberg, Arthur L.; Friedberg, Ira S. (2013). Paper Money of the United States: A Complete Illustrated Guide With Valuations (20th ed.). Coin & Currency Institute. ISBN 978-0-87184-520-7. Retrieved February 16, 2018. This page was last edited on 4 April 2019, at 00:26 (UTC).